Quick setting, expansive plaster, it stops instantly water infiltrations, even with the presence of pressure in concrete or masonry structures. Ready to use, it has to be mixed only with clean water. It does not shrink and depending on the temperature of the support and of the water in the mixture, it will set within 3-5 min. Once it has hardened it will become an integrated part of the surface where it has been applied. It stops water infiltrations and waterproofs all the surfaces where it is applied. It does not shrink, it does not crack and it is long lasting. It expands during setting. Its quick setting time is between 3 to 5 min. It is non-toxic when in contact with drinking water. Its mechanical properties are superior to those owned by concrete. It sets even under water. Easy to apply, it does not require specialized labor. It stops all water infiltrations caused by fissures in the concrete or in the underground masonry: elevator shafts, cesspools, sewage, cisterns, tanks and tunnels. 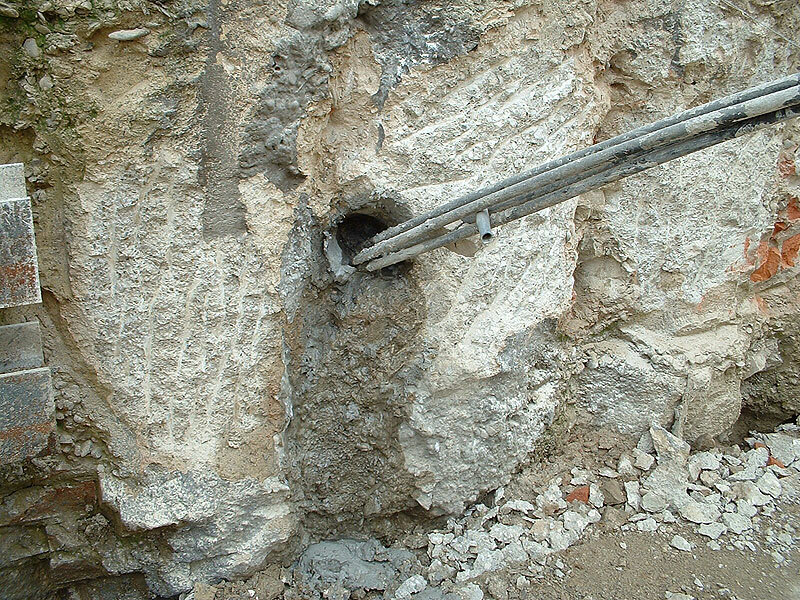 It also seals fissures in floor-wall joints and holes created by the tension rods of concrete formworks. It is used to adjust all the concrete construction faults. Its expansive properties allow to fix I-beams, to seal up pipes, anchoring bolts, etc..
All the fissures and the cavities must have a width of 2 cm and a depth of at least 2 cm. Open the cavity with a square cut, preferably an inverse dove-tailed one. Avoid a "V" cut opening. Clean the surface by removing any residues and wet it right before the application. In case of anchorages, create a hole wide enough to allow the bolt or the I-beam, that need to be drowned in cement, to be at least 1,5 cm away from the rim. Prepare only the quantity that can be used within 3 min. Add water to the powder until you reach the consistency of a concrete plaster. One kg of powder requires 230 cm³ of water (23% circa). The product can be applied with a trowel, a putty knife or by hand. Fill the fissures and the cavities by loading them to the brim. When the cracks or the joints are subject to water leakages, do not apply straight away the material but wait for it to warm up before applying it. 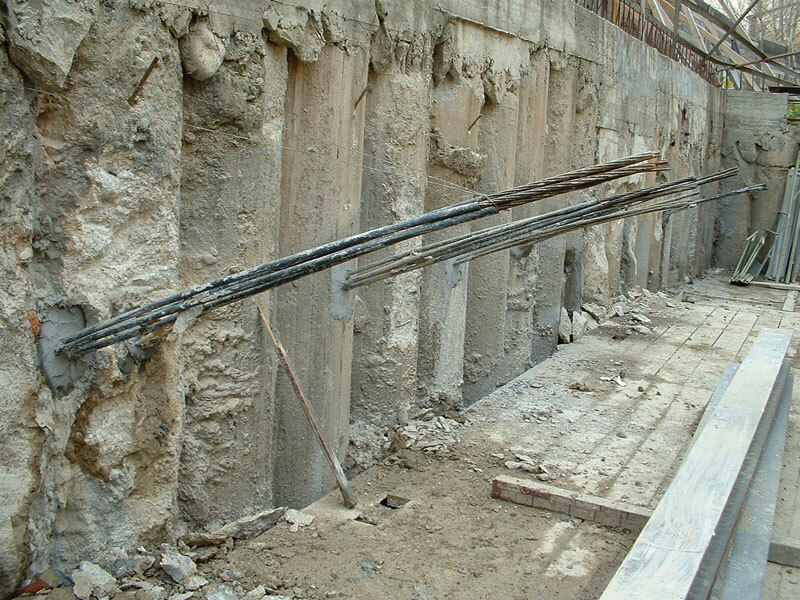 When strong pressures occurs in tunnels and foundations, do not seal the crack with just one application. Leave a small hole to allow the water to dribble in order to reduce the pressure, this will let the material set. Successively plug the hole. Incidence: 1 kg of material fills roughly 600 cm³. Mix the product with clean water. Do not regenerate the mixture. Mix only the quantity of product that can be used within 3 min. The setting time is of 3 min at 20°C. With cold temperatures use lukewarm water, with hot temperature use either cold water or ice.